Christmas Day in the Orthodox world, and for the Ukrainians, a once in seven centuries special Christmas. A great Christmas address by Pres Poroshenko. Decree now on public display at the medieval St. Sophia cathedral. Multiple religious services. Pres Poroshenko calls for a public Christmas Day prayer meeting. 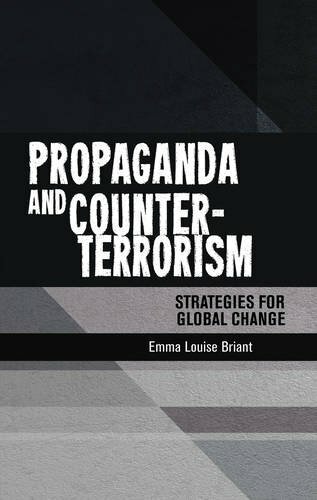 On a much less festive note, the Russians appear to be conducting a false flag messaging campaign encouraging and advocating violence against the ROC in Ukraine, and the protagonists identifying themselves as Ukrainian “Right Sector” activists. Ukrainian MoD has issued a formal warning via social media. The real Right Sector vehemently deny any connection. Since this falls inside the umbrella of the Russian propaganda campaign, the only plausible explanation is yet another Russian false flag campaign. Try to spoil Christmas for the detested Ukrops. Excellent analyses by Kuzio, Amb Herbst, and some very nice public statements on the political context by Pres Poroshenko. It’s Christmas Eve in Kyiv, and Ukraine just won a major victory in its long struggle for independence from Moscow. On January 5, Ecumenical Patriarch Bartholomew affirmed the independence of the new Ukrainian Orthodox Church in Istanbul. Ukraine now joins fourteen other autocephalous churches making up the Orthodox Christian world. This formally severs the tie between Orthodoxy in Ukraine and the Moscow Patriarchate, which from the late seventeenth century had canonical authority over Ukraine’s Orthodox believers. The tomos, or decree of independence, follows the church conference in Kyiv last month that created a single Ukrainian Orthodox church out of the Orthodox Church of Ukraine (Kyiv Patriarchate) and the Autocephalous Ukrainian Church. Two Bishops and some priests from the Ukrainian Orthodox Church (Moscow Patriarchate) also participated in the conference and joined the new Ukrainian church. This is a huge blow to Moscow’s Patriarch Kirill and his close ally, Russian President Vladimir Putin, whose policies Kirill faithfully supports. It is also a large step in Ukraine’s efforts to free itself of Kremlin influence. The Moscow Patriarchate has been a very effective instrument of Kremlin soft power. Before the tomos, the Moscow Patriarchate could claim that the Orthodox churches in Ukraine not under its control had no canonical status in the Orthodox world. This is no longer true. The Moscow Patriarchate had been losing believers in Ukraine since at least the Orange Revolution in 2004 when it backed Moscow’s opposition to the changes, and this trend only accelerated after the Kremlin seized Crimea and launched a hybrid war in the Donbas. But the fight isn’t over. The Kremlin and the Moscow Patriarchate will fight hard to retain its church position in Ukraine. That was evident at the unification sobor in December where only two Moscow Patriarchate bishops participated, while as many as twenty-five had indicated their readiness to participate. It was also evident in the decision of the Moscow Patriarchate to sever relations with the Ecumenical Patriarchate over the decision to grant autocephaly to the Ukrainian Church. But this is a war that the Moscow Patriarchate and its Kremlin backers cannot win. While the Ukrainian Orthodox Church joins the fourteen other autocephalous churches, its relationship with the Ecumenical Patriarchate will need refinement. The tomos states that the Ecumenical Patriarchate must approve any changes from the language of the tomos. At least one part of the tomos is something that the Ukrainian Church will want to change, since it states that the Ukrainian church only has jurisdiction in Ukraine. This means that Ukrainian Orthodox parishes outside of Ukraine will be under the Ecumenical Patriarchate This is a nice gift to Constantinople and a reminder to all of the meaning of the adjective “byzantine.” The insistence that parishes outside of Ukraine must fall under the Ecumenical Patriarch will not be welcome by Ukrainian believers, and many such parishes may not go along. These complications are a reminder that the tomos is one more step—critical to be sure, but just one step—in the emergence of a united and independent Ukrainian church. Even with these limitations, the tomos is a very good thing for Ukraine and a victory for Ukrainian President Petro Poroshenko, who has worked hard, along with Patriarch Filaret of the now-defunct Kyiv Patriarchate. John E. Herbst is the director of the Eurasia Center at the Atlantic Council. He served as the US ambassador to Ukraine from 2003-2006. President Petro Poroshenko addressed Ukrainians after the Christmas Liturgy in St. Sophia Cathedral conducted by Primate of the UOC His Beatitude Metropolitan Epifaniy. He emphasized that a miracle had happened on the festive days. “This year, the voices of Ukrainians have much more faith in victory and confidence. For the Lord has shown us a real Christmas miracle recently. This year’s Christmas is especially great and solemn for us. 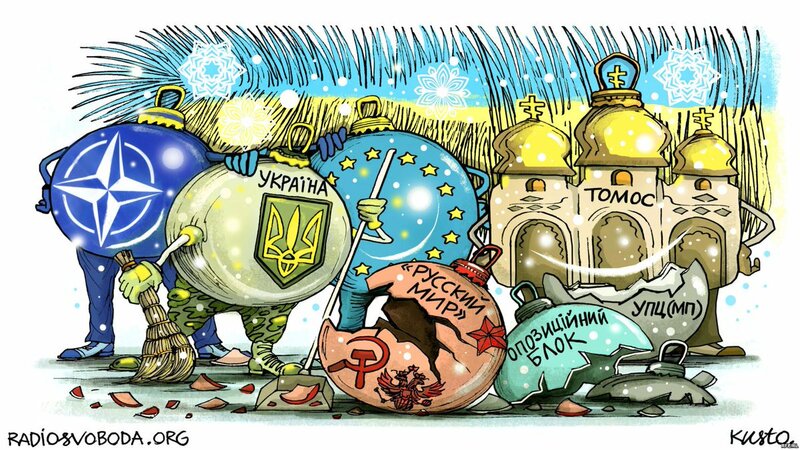 The holiday is double – the Orthodox Church of Ukraine received the Tomos of autocephaly,” Petro Poroshenko said. “We have finally liberated our ancient Church, whose history dates back to the time of Equal of the Apostles Prince Vladimir, from Moscow’s captivity. Equal to the equal, our Church has joined the family, which now consists of 15 independent Orthodox churches,” the President noted. We have finally liberated our ancient Church, whose history dates back to the time of Equal of the Apostles Prince Vladimir, from Moscow’s captivity. Equal to the equal, our Church has joined the family, which now consists of 15 independent Orthodox churches. Petro Poroshenko emphasized that with the Tomos, “the Ukrainian star shone in the constellation of independent and equal national churches”. “This constellation, in the words of His All-Holiness Ecumenical Patriarch Bartholomew, is the world Orthodoxy,” he added. “The creation of the autocephalous Orthodox Church of Ukraine is the key to our independence. This is the foundation of our spiritual freedom. We have torn up the last chains that tied us to Moscow with its fantasies of Ukraine as a canonical territory of the Russian Orthodox Church. It will not be so anymore,” the President stressed. After the festive Liturgy, Petro Poroshenko and his wife and children talked to people who gathered near the walls of the majestic St. Sophia, listened to the carols and gave gifts to the children. People thanked the President for his efforts in obtaining the Tomos of independence of the Ukrainian Orthodox Church. “These thousand-year-old walls have finally witnessed the event awaited by generations of Ukrainians. They dreamed, prayed. This was made possible by the efforts of tens of millions of Ukrainians who prayed in Ukraine and throughout the world. Many generations prayed for the Lord to give us an independent, autocephalous church,” President Petro Poroshenko addressed the Ukrainians after the Christmas Liturgy. “God heard us and we celebrate today,” the Head of State added. “We have been repeatedly convinced that nothing is impossible for us, when we share solidarity, when we all act together as a single Ukrainian political nation,” Petro Poroshenko said. The President stressed: “This applies not only to the Tomos, but also to the Association Agreement with the European Union. This applies to the visa-free regime, energy and gas independence from Russia … As well as other complicated tasks that we have solved over the past five years as part of our Ukrainian, European and Euro-Atlantic state strategy”. “What we are striving for and what looks at the first sight beyond one’s strength will come true in the future. In Ukraine we say: What the eye fears, the hands do. And there will be a result. The victory will come, peace will come. And Ukraine – a successful country, a prosperous country, a happy country – will become a member of the European Union and NATO,” the President is convinced. According to him, the word “Tomos” has not just entered the Ukrainian language. “The word “Tomos” became the word of the year. This fact is extremely eloquent. After all, the language is created by the people, and they add only crucial terms. The Tomos was added to such neologisms as Euromaidan, cyborg, visa-free regime… This is all part of our great history,” he added. “I congratulate all Ukrainian people on the Tomos of autocephaly. Notwithstanding the religion, because it is the basis of the spiritual independence of our state,” Petro Poroshenko said. The President congratulated everyone on Christmas: “I wish everyone joy, peace and faith. May our common prayer and sincere wishes establish goodness and love in our land”. President of Ukraine Petro Poroshenko stated that Ukraine has finally severed the ties, which connected it with the Russian Federation as 112 Ukraine reported. “The heart of Kyiv is Saint Sophia Cathedral. Its millennia-old walls waited until the event of which a lot of generations dreamed. Now, the first service, after the delivery of Tomos, takes place here, under the cover of Orante – Solid wall, which kept this cathedral, Kyiv and the whole country for centuries…The creation of the Ukrainian Autocephalous Orthodox Church is a pledge of our independence. It is the foundation of our spiritual freedom. We have severed the last ties, which connected us with Moscow, its fantasies about Ukraine as canonical territory of the Russian Orthodox Church,” he noted. The Ukrainian president expressed the hope that other dreams of the citizens of Ukraine will come true. “The victory and peace will come. And Ukraine successful and wealthy will become the member of the EU and NATO,” he emphasized and congratulated the Ukrainian on Christmas. “I congratulate you on the great Christmas holiday from the Heart. I congratulate on Tomos on autocephaly. I wish you joy, peace and belief to our big united family. Let’s our joint work and sincere prayers to confirm goodness and love on our land,” he concluded. Ukrainian President Petro Poroshenko says Ukraine, with the creation of the autocephalous Orthodox Church of Ukraine, has finally severed ties with Russia. The creation of the Orthodox Church of Ukraine is the key to the country’s independence, the head of state said. Ukrainian President Petro Poroshenko says Ukraine, with the creation of the autocephalous Orthodox Church of Ukraine, has finally severed ties with Russia. “The creation of the autocephalous Orthodox Church of Ukraine is the pledge of our independence. This is the foundation of our spiritual freedom. We’ve severed the last ties that connected us with Moscow and its fantasies about Ukraine as the canonical territory of the Russian Orthodox Church. This is not and won’t be anymore,” he said at the Christmas liturgy in St. Sophia Cathedral in Kyiv where the tomos of autocephaly of the Orthodox Church of Ukraine was shown to the public. As UNIAN reported, Ecumenical Patriarch Bartholomew I on January 5, 2019, signed the tomos in his residence in Istanbul, which proclaims the autocephaly of the newly formed Orthodox Church of Ukraine. The tomos says that the Ecumenical Patriarchate recognizes a canonical, autocephalous, self-governing Orthodox Church within the limits of the politically formed territory of Ukraine. The document also sets out the basic principles for the functioning of the Orthodox Church of Ukraine. On January 7, the tomos was exhibited for the public at St. Sophia’s Cathedral in Kyiv. Ukrainian President Petro Poroshenko has criticized Moscow’s statements on alleged financial benefits that the Ecumenical Patriarchate of Constantinople has received from the entire procedure of granting the tomos, a decree of autocephaly (independence) of the Orthodox Church of Ukraine. Such a reaction of Moscow also shows that it is weaker than many consider in the West. Ukrainian President Petro Poroshenko has criticized Moscow’s statements on alleged financial benefits that the Ecumenical Patriarchate of Constantinople has received from the entire procedure of granting the tomos, a decree of autocephaly (independence) of the Orthodox Church of Ukraine. “In such statements there is nothing sound. They are evil as such. But honestly, after years of Russian aggression and our struggle to restore sovereignty and territorial integrity, we did not expect anything else from Moscow. One who recalls Russian stories about “green men” in Crimea, “vacationers” in Donbas, MH17 and Salisbury should not get into the Kremlin’s trap once again,” Poroshenko told the Greek newspaper TaNea. “The Russian leadership is notorious for lies, deception and fake news. Many times they were caught red-handed, spreading lies, but they continue. The very nature of the war that Putin and his regime wage against the democratic world involves discrediting, labeling and counterfeiting,” Poroshenko said. At the same time, the Ukrainian president noted that this fake, created by the Kremlin, is quite demonstrative, since it shows how Moscow perceives the world. “They believe that without a financial reward nothing is possible. I believe that when it comes to confidence and belief in God, especially the restoration of historical truth, there is no place for financial gain. Those who think differently or advocate such fake are servants of the Kremlin in its aspirations against Ukraine’s independence and the free world as such,” he said. “There is no money in the world that could buy such people as His All-Holiness Bartholomew. I think people in the Kremlin know this – and, thus, try to falsify his motives. However, God and history know the truth. And those who spread lies, ultimately, will fail. If there is anything from which His All-Holiness gained benefits, it is from the true devotion of Ukraine to the power of faith and the power of God. The Autocephalous Orthodox Church of Ukraine will enrich the world Orthodoxy,” the president said. According to the president, such a reaction of Moscow also shows that it is weaker than many consider in the West. “This is a great lesson. The Kremlin invests all efforts in its image, as if it is impeccable, invincible and omnipotent. This is just another fake. Therefore, Moscow is very angry at Constantinople, because it rejected any claims of Russia regarding Ukraine as its canonical territory,” he said. He added that the Kremlin does not even conceal the fact that the Russian Orthodox Church is considered one of the key instruments of keeping Ukraine in orbit and within the “Russian world.” “Moscow, the Kremlin got too used to making the church one of the tools in its hybrid aggression. Creating an independent Orthodox Church in Ukraine deprives them of these opportunities or severely restricts them,” he said. “All Moscow’s claims concern the authorities and control over the territory, not faith and love,” Poroshenko said, adding that the situation in the Ukrainian Orthodoxy was discussed at the Russian Security Council under the chairmanship of the Russian president. “When the Russian President says that the collapse of the USSR became the main geopolitical catastrophe of the twentieth century for Russia, the independent Ukrainian church would become the second,” he added. President of Ukraine Petro Poroshenko said this in his Christmas greeting, made public on the official website of the head of state. “We have finally liberated from Moscow’s captivity our ancient Church, whose history dates back to the time of the Equal of the Apostles Prince Vladimir. And it, equal between equal ones, has entered the family, which now consists of fifteen independent Orthodox churches,“ the president noted. At the same time, Poroshenko stressed that Christmas is first of all a family holiday. And this day, we, Ukrainians, traditionally meet with relatives and loved ones. “I congratulate everyone on Christmas and on the birth of the independent Orthodox Church of Ukraine,” he stressed. “May the incessant light of the Bethlehem Star become a source of optimism and faith in the fortunate future for all Ukrainians. May the Christmastime give each family peace and calm, may all of us be united by our native Ukraine, which we love so much and which we are proud of,” the president’s wife, Maryna Poroshenko, noted in her congratulations. As reported, on January 6, 2019, the ceremony to hand over a tomos of autocephaly to the united Orthodox Church of Ukraine took place at the Patriarchal Church of St. George in Istanbul. Ecumenical Patriarch Bartholomew gave the document to Metropolitan of Kyiv and All Ukraine Epiphanius. President of Ukraine Petro Poroshenko guarantees the state’s respect for the religious choice of every citizen of the country. He said this in a statement that was broadcasted by 112 Ukraine after the ceremony of granting Tomos about the autocephaly to the Orthodox Church of Ukraine. “As president, on behalf of the state I guarantee that Ukraine will respect the religious choice, freedom of religion of every citizen,” he said, and then congratulated all Ukrainians on a historic event. “Congratulations to all those who are not indifferent with the creation of the autocephalous Orthodox Church of Ukraine! Thanks to everyone who worked tirelessly on its development, created unity and restored justice. We have fulfilled our duty to past and future generations. Thank God! Glory to Ukraine!” he said. The Orthodox Church of Ukraine warns about the preparation of provocations against believers and hierarchs of the Ukrainian Orthodox Church (UOC) of the Moscow Patriarchate. This is stated in the message of the Synodal Directorate of OCU Military Clergy, posted on Facebook. “There is information from military priests (chaplains) from different regions of Ukraine that allegedly provocations on religious grounds are organized on behalf of the Right Sector. The organizers of these provocations call for the use of force against believers and clerics of the Russian Orthodox Church in Ukraine,” he said. It also clarifies that the actions should be filmed to create a media image of “persecution” and “religious war” in Ukraine, which are constantly spoken about in the Kremlin media. “We urge to be vigilant, not to succumb to provocative actions. We will not allow the aggressor to spoil the holiday to the Ukrainians on these historical days – getting Tomos about the autocephaly of the Orthodox Church of Ukraine”, summarized in the message. Earlier Ecumenical Patriarch Bartholomew passed the Tomos of autocephaly and bishops’ crosier to primate of the Orthodox Church of Ukraine Epifaniy. The event happened during the festive service in St. George’s Cathedral. The Orthodox Church of Ukraine issued a statement on Jan. 6, through Facebook, citing the possibility of aggressive behavior against Russian churches in Ukraine by pro-Russian forces using the name of Ukrainian nationalist organizations to spark a religious confrontation. According to church authorities, chaplains from all over the country cite a growing number of provocations against the Moscow-backed Ukrainian Orthodox Church from activists using the name of Right Sector, a Ukrainian nationalist organization. “The organizers of these provocations call for the use of force against the clergy of the Russian Orthodox Church in Ukraine and their followers. The provocations should take place on cameras to create a media image of the “persecution” and a “religious war” in Ukraine, which are constantly brought up by Kremlin media,” the Ukrainian church said in a Facebook post. On the same day, the Right Sector issued a statement on their official website denying any involvement in attacks on churches and pledged to act within the law, stating that their name might be used by pro-Russian forces to generate violence for Russian state media. A number of high-rankinig Ukrainian officials in the past week stated that Russia might provoke religious violence in Ukraine to promote its own agenda. Pavlo Klimkin, Ukraine’s minister of foreign affairs, while answering questions by the media on Jan. 5 from Istanbul – where the newly established Orthodox Church of Ukraine received independence on Jan. 6 – said that provocations will take place to depict the newly established Ukrainian church in a bad light. “Most certainly and I’m not saying this simply to increase tension,” Klimkin said, according to Gordonua news agency. The statement was supported by Stepan Poltorak, Ukraine’s defense minister. As part of the same delegation, Poltorak said that he is aware of possible staged conflicts. “Over the past years Russia has been provoking and conducting aggression against Ukraine. Recently its activity against Ukraine has increased significantly, and of course, we are receiving information about the possibility of provocations by the Russian Federation, but we are tracking and responding accordingly,” said Poltorak, according to Gordonua. This year, Christmas is especially great and especially solemn for us. The holiday is double because the Orthodox Church of Ukraine received the Tomos of autocephaly. We have finally liberated from Moscow’s captivity our ancient Church, whose history dates back to the time of the Equal of the Apostles Prince Vladimir. And it, equal between equal ones, has entered the family, which now consists of fifteen independent Orthodox churches. I congratulate you from Fener, the residence of the Ecumenical Patriarch, where celebrations are held on the occasion of granting the Tomos. The newly independent Ukrainian Orthodox Church held a service in Kyiv on January 7 marking Orthodox Christmas and celebrating their break with the Russian Orthodox Church. Ukrainian President Petro Poroshenko and other top officials attended the ceremony at the St. Sofia Cathedral. The Ukrainian Orthodox Church became independent on January 6 with the handover of a “tomos” of autocephaly, an official church document, to Ukrainian Metropolitan Epifaniy. The development ends more than 330 years of Russian religious control in Ukraine. Head of Ukrainian Orthodox Autocephalous Church, Metropolitian of Kyiv and All Ukraine Epifaniy has begun the Christmas liturgy at Saint Sophia Cathedral in Kyiv as 112 Ukraine broadcasted. As the correspondent of 112 Ukraine reported, the entry to the territory of cathedral and cathedral itself is restricted. All wishing people can observe the liturgy from the big display installed at Sophia’s Square. Ecumenical Patriarch Bartholomew of Constantinople has handed over a “tomos” of autocephaly to Metropolitan Epifaniy of the new Orthodox Church in Ukraine. Bartholomew presented the document at a church service in Istanbul on January 6, after signing it during a ceremony the previous day. The historic document ends more than 330 years of Russian religious control in Ukraine. President Petro Poroshenko together with Primate of the Orthodox Church of Ukraine His Beatitude Metropolitan Epifaniy brought the Tomos of autocephaly of the Orthodox Church of Ukraine to St. Sophia’s Cathedral in Kyiv. The Tomos of autocephaly of the Orthodox Church of Ukraine was solemnly installed in front of the royal gates in St. Sophia. Primate of the Orthodox Church of Ukraine His Beatitude Metropolitan Epifaniy together with the hierarchs of the Orthodox Church of Ukraine conducted the festive Christmas Liturgy. The priests and faithful prayed for the Ukrainian army and Ukrainian authorities, for peace and prosperity in Ukraine, for the autocephalous Orthodox Church of Ukraine. In his words to the flock, His Beatitude Metropolitan Epifaniy emphasized that “the doors of the autocephalous Orthodox Church are open to everyone who wants to serve God and its people” and called for love and unity. His Beatitude Metropolitan Epifaniy congratulated everyone on Christmas and New Year. “We convey our warm congratulations to the Armed Forces of Ukraine and to all our brave defenders who protect the homeland selflessly. We extend our prayers for them to God and ask him to protect them,” he especially emphasized. The Primate of the Orthodox Church of Ukraine also conveyed congratulations and prayers for the support and protection of Ukrainians in occupation and Russian captivity. He emphasizes that December 15, 2018, when the Unity Council of the Orthodox Church of Ukraine was held in St. Sophia, and January 5 and 6, 2019, when the Tomos of autocephaly, “our church spiritual independence” was proclaimed, signed and handed over will enter the history of our church and state. “Dear President, thank you for the assistance in this difficult time for us to succeed in this pious work … Your name is not only here, on this parchment (Tomos – ed.). It will be always remembered as of the one who helped our Church break those spiritual chains and have an autocephalous and independent status,” the Primate of the Orthodox Church of Ukraine noted and wished the President God’s help in building up a strong and independent Ukrainian state. The President stressed that for the first time the bright day of Christmas is celebrated by Ukrainians in the autocephalous Orthodox Church of Ukraine in the walls of St. Sophia. “For the first time, its Primate His Beatitude Epifaniy concelebrated yesterday with Ecumenical Patriarch Bartholomew and received the Tomos from his hands as a charter of the recognition of the independence of our Ukrainian Church,” the Head of State emphasized. “Whoever wants to make sure of this, will have an opportunity to read it,” Petro Poroshenko added. On Christmas Day, January 7, a liturgy started in St. Sophia Cathedral in Kyiv where a tomos of autocephaly of the Orthodox Church of Ukraine as one of the 15 local Orthodox churches is being shown to the public. Epifaniy, a newly-elected Metropolitan of the new Orthodox Church of Ukraine, will hold a liturgy in St. Sophia Cathedral. 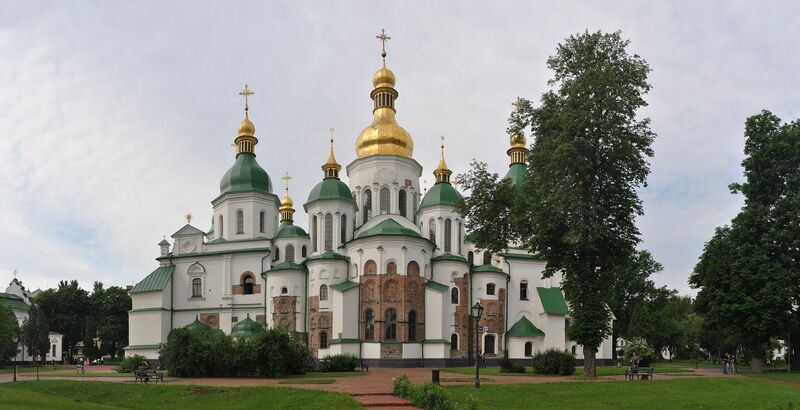 Tomos about the autocephaly of the Orthodox Church of Ukraine was transferred to the refectory church on the territory of St. Sophia Cathedral. The people who wanted to see an important document lined up in front of the church. This was reported by 112 Ukraine. According to the correspondent, the queue at the entrance to the temple is moving fast, there is no crowd. It is noteworthy that Tomos will continue to be located in the church on the territory of St. Sophia Cathedral. The refectory temple is open for believers daily, from 8:00 to 18:00. Earlier Ecumenical Patriarch Bartholomew passed the Tomos of autocephaly and bishops’ crosier to primate of the Orthodox Church of Ukraine Epifaniy. The event happened during the festive service in St. George’s Cathedral. For Christmas in Sofia, Kyiv, the head of the Orthodox Church of Ukraine, Metropolitan of Kyiv and All Ukraine Epiphanius will complete the festive Liturgy. During the service in Sofia, Kyiv will have a long-awaited tomos – a document that Ecumenical Patriarch Bartholomew delivered to the head of the Orthodox Church of Ukraine on January 6, 2019. The official signing of tomos by the Ecumenical Patriarch Bartholomew was held in Istanbul on January 5, 2019, and on January 6, after the divine liturgy, this document on autocephaly was handed over to the Metropolitan of the Orthodox Church of Ukraine, Epiphanius. Radio Liberty was watching events in Istanbul and showing them live. DW News Published on Jan 6, 2019 The newly founded Ukrainian Orthodox Church held its first Christmas mass in the Ukraine capital of Kiev. The service comes just hours after church leaders formally received a decree of independence at a ceremony in Istanbul, ending more than three centuries of Russian influence. Ukraine together with the entire Orthodox world living according to the Julian calendar is today observing Christmas Eve, Sviat Vechir, a ritual meal, which is prepared with twelve meatless dishes on the evening before Christmas to commemorate Christ’s birth. Kutia is one of the main attributes of Holy Meal in Ukraine. Ukraine together with the entire Orthodox world living according to the Julian calendar is today observing Christmas Eve, Sviat Vechir, a ritual meal, which is prepared with twelve meatless dishes on the evening before Christmas to commemorate Christ’s birth. It is the concluding day of the Nativity Fast and is observed as a day of strict fasting before Holy Meal. The twelve dishes symbolize the Twelve Apostles. The main attributes of Holy Meal in Ukraine are kutia, or kutya, a cereal dish with poppy seed, nuts, honey, and uzvar, a drink made from dried fruits, usually slices of apples, pears, plums. Leader of the Orthodox Church of Ukraine, Metropolitan of Kyiv and All Ukraine Epifaniy (Epiphanius) has called on Ecumenical Patriarch Bartholomew I and all local Orthodox churches to pray for peace in Ukraine and for the release of those who are held captive or illegally detained. Ecumenical Patriarch Bartholomew I handed the tomos of autocephaly (independence) over to leader of the Orthodox Church of Ukraine, Metropolitan of Kyiv and All Ukraine Epifaniy in Istanbul on Sunday, January 6. President Petro Poroshenko called on fellow citizens to gather tomorrow, January 7, in the Sofiivska Square for a common prayer for the establishment of the United Local Orthodox Church of Ukraine. This is stated in the message of the president on Facebook. “I urge all concerned Ukrainians to gather on January 7 at 10 a.m. on Sofiivska Square to pray together to the Lord for having revived and established the United Local Orthodox Church,” Poroshenko said. The head of the Orthodox Church of Ukraine (OCU), Metropolitan of Kyiv and All Ukraine, Epifaniy thanked the Ecumenical Patriarchate for providing Tomos and urged them to pray for a just peace for Ukraine and those who are in captivity. In particular, he said this after the solemn ceremony of presenting Tomos in the Cathedral of St. George in Istanbul, Interfax-Ukraine reports. “Together with the prayers of gratitude, we also today make a request to God for our Ukrainian people, who have suffered for five years from the war brought from outside to our peaceful home. We ask your All-Saints, All Mother-Church and all local Churches to pray for a just peace for Ukraine “, said Epifaniy. The tomos on the autocephaly of the Orthodox Church of Ukraine (OCU) says that the central church of the Orthodox Church of Ukraine (OCU) will be located in Kyiv, the Church is not authorized to appoint bishops and establish parishes outside the country. “With this signed patriarchal and synodal tomos, we recognize and proclaim the established autocephalous Church within Ukraine as our spiritual daughter and call upon all global Orthodox churches to recognize her as a sister… as such, which has the historical city of Kyiv as the chair and cannot appoint bishops or establish parishes outside the state,” the text of Tomos, translated into Ukrainian, posted by the Ukrainian Ambassador to Turkey Andrii Sybiha in his Twitter account, says. According to the document, the already existing parishes of the OCU are now subject to the Universal Throne, which has canonical powers in the diaspora, since “the jurisdiction of this Church is limited to the territory of the Ukrainian state.” The OCU gets privileges and all sovereign rights belonging to autocephalous church authority. As for the internal church administration, it is considered, judged and determined solely by the Metropolitan of Kyiv and All Ukraine and the Holy Synod. “The Autocephalous Church of Ukraine recognizes the Most Holy Apostolic and Patriarchal Ecumenical Throne as the chair… The Metropolitan of Kyiv and All Ukraine, as well as the hierarchs of the Most Holy Church of Ukraine, are now elected in accordance with the provisions of the divine and sacred canons and in accordance with the relevant provisions of its Charter, which must necessarily comply with the provisions of this patriarchal and synodal tomos,” the document says. According to the tomos, in order to resolve “significant issues of a church, dogmatic or canonical nature,” the Metropolitan of Kyiv and All Ukraine should address the Ecumenical Throne on behalf of the Holy Synod of the OCU. “Our Holy Christ of the Great Church blesses and proclaims the autocephalous Orthodox Church of Ukraine,” the document says. Ukrainian President Petro Poroshenko says that the tomos, a decree of autocephaly (independence), which has been granted to the Orthodox Church of Ukraine, is as important as the Act of Declaration of Independence of Ukraine. The Ukrainian president congratulated the Ukrainians on this important event in Ukraine’s history. In the evening, January 6, the plane with Tomos about the autocephaly of the Orthodox Church of Ukraine (OCU) landed in Kyiv. This is reported by the Priamyi TV channel. “We reliably know that Tomos is already in Ukraine. It will be delivered to Sofia Kyivska with motorcade,” the report says. Earlier President Petro Poroshenko called on fellow citizens to gather tomorrow, January 7, in the Sofiivska Square for a common prayer for the establishment of the United Local Orthodox Church of Ukraine. This is stated in the message of the president on Facebook. “I urge all concerned Ukrainians to gather on January 7 at 10 a.m. on Sofiivska Square to pray together to the Lord for having revived and established the United Local Orthodox Church,” Poroshenko said. Dozens of men braved the cold and jumped into the waters of the Bosphorus to grab a cross flung by Ecumenical Patriarch Bartholomew, the spiritual leader of most Orthodox Christians worldwide. Ukrainian President Petro Poroshenko and Ukrainian Metropolitan Epifaniy stood by during the traditional event on January 6 which followed a mass in Istanbul’s St. George’s Cathedral where Bartholomew presented the head of the Ukrainian church with a decree granting it independence from the Russian Orthodox Church — a historic split strongly opposed by Moscow. The date of delivery of Tomos was announced for a long time ago. It became known on December 13, 2018, that its handing will take place in Constantinople (Istanbul) on January 6, 2019. Ecumenical Patriarch will hand the Tomos to the Head of Ukrainian Orthodox Autocephalous Church. At the name of the church’s head was unknown at the moment of the announcement of delivery’s date. It was called on December 15, when the Unification Assembly took place in Kyiv. That day Metropolitan Epiphaniy headed Orthodox Church of Ukraine. The Ecumenical Patriarchate confirmed the date of Tomos handing the next day. It will take place on January 6 in Fener (Istanbul district) on Epiphany Day. Metropolitan Epiphaniy has already revealed the first decision, which will be made after the provision of Tomos. “The first decision, of course, is the forming of the proper bodies as we adopted the charter at the Unification Assembly but it will be approved by Tomos so the charter is based on the norms, which are spelled out in Tomos. After the delivery of Tomos, we will become the full-fledged Autocephalous Orthodox Church recognized by the World Orthodoxy.” We dealt with brief chronology, so let’s move to the main topic. Orthodox Christianity’s foremost leader presented Ukraine’s new church with a decree of independence, ignoring Russian claims that its church has sole authority there and handing Ukraine a victory in its attempts to diminish Russia’s influence. The Ecumenical Patriarch of Constantinople has presented a decree of independence to the Metropolitan bishop of the nascent Orthodox Church of Ukraine. The Ukrainian Canadian Congress congratulated Ukraine with the provision of Tomos on autocephaly as the organization reported. “This is an epochal day for all Ukrainians, no matter what their faith or confession is. With the granting of the Tomos of Autocephaly, the Orthodox Church of Ukraine takes its rightful place among the world’s Orthodox Churches,” Alexandra Chyczij, the president of the congress said. Honorary Patriarch of the Orthodox Church of Ukraine Filaret believes that the Ukrainian Church will be recognized as patriarchy and there will be no split in the world Orthodoxy. He stated this in an interview with ‘Pryamy’ TV channel. “So far, we have been recognized as a archeparchy, and we agree with that. Although we were patriarchy for 25 years, we now agreed that we are a archeparchy, but a for all the Orthodoxy. We can claim the patriarchy because we are a big church. We have hope that, over time, the Constantinople Ecumenical Patriarch will recognize the Ukrainian Church as patriarchy. This is the future, but it will be so,” Filaret said. According to him, after receiving Tomos about the autocephaly by the Ukrainian church, a significant part of the Orthodox churches will start communicating with it. Translation: “Russian World”, “Opposition Bloc” and “UOC (MP)” on broken Christmas decorations. The Ukrainian Orthodox Church under the Moscow Patriarchate will not partake in full communion with the officially recognized Orthodox Church of Ukraine, Archbishop Clement, the head of the information and educational department of the Moscow-backed church, said in a comment to Russian TASS news agency on Jan. 6. “We will not have communion with the ‘new’ church. If we would perform mass with them, we would become the same schismatics as they are, and then we will also not be recognized (by the Russian Orthodox Church),” said Clement. According to Clement, the Moscow-backed Ukrainian Orthodox Church doesn’t see any possibility to reconciliate with the newly established independent Orthodox Church of Ukraine after the later received its tomos, or a decree of autocephaly, from the Ecumenical Patriarch of Constantinople Bartholomew I. The Moscow-backed church remains separate from the Ukrainian Orthodox Church. “There was a very active dialogue between religious organizations until recently, the platform for which was the All-Ukrainian Council of Churches, which included the Kyiv Patriarchate and the Autocephalous Church. Because they eliminated (these negotiations), I am not ready to say what format of dialogue is possible,” he said. The recently established Orthodox Church of Ukraine gained official independence on Jan. 6, receiving the signed decree of autocephaly from the Ecumenical Patriarch in Saint George’s Cathedral in Istanbul. The Ukrainian church became the 15th officially recognized Eastern Orthodox church by the Ecumenical Patriarchate. Back in October, during a meeting of the Holy Synod of the Russian Orthodox Church in Minsk, the Russian Orthodox Church accused the Istanbul-based Ecumenical Patriarchate of Constantinople of the invasion of its canonical territory and decided to cut religious ties between the two patriarchates. According to Andriy Parubiy, speaker of the Verkhovna Rada, around 40 local parishes belonging to the Moscow-backed church decided to transfer to the jurisdiction of the Orthodox Church of Ukraine. Altogether, there are around 12,000 parishes in Ukraine under the Moscow Patriarchate. “More than 40 parishes that have already switched (jurisdictions) have demonstrated the high culture of our citizens and the high culture of believers, and the state’s ability to control this process,” Parubiy told Pryamiy TV channel on Jan. 6. The Ukrainian Orthodox Church won’t hold worship with the Orthodox Church of Ukraine, since it is a “non-canonical religious organization”, Head of the Synodal Information and Education Department of the UOC Archbishop Kliment claimed this in the commentary to TASS. ‘We won’t hold divine services with the “new” church. If we had such services, then we would be the same schismatics as they are, and then the local church would not recognize us,’ he said.